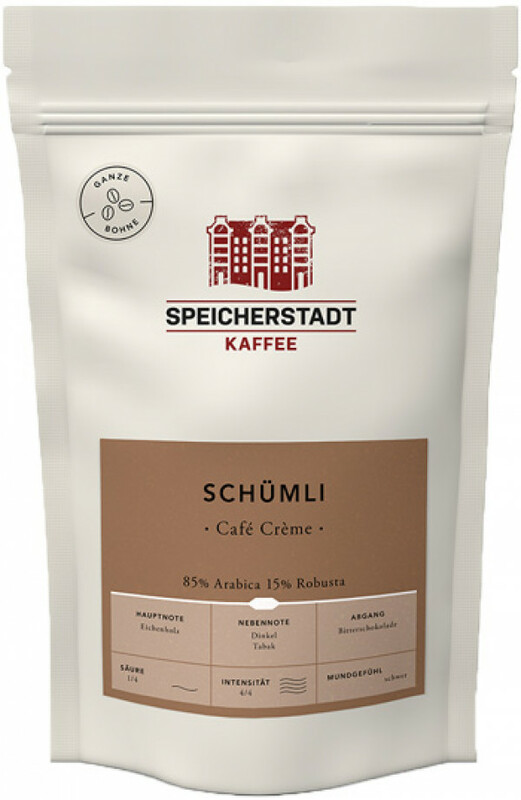 The Schümli Caffe Créme is particularly suitable for portafilter and fully automatic machines. It is also excellent for use in cookers, coffee machines and hand infusions. It is a particularly creamy and intensive blend of 85% Arabica and 15% Robusta beans for a great and powerful coffee. The long-lasting full-bodied taste is created from the best varieties from Brazil and India. Which results in both a mild espresso and a strong coffee. Its incomparable aroma gives the Schümli delicate notes of tobacco, spelt, oak wood and dark chocolate. Schümli Café stands for a mild espresso that is drunk as coffee, whereby the crema or foam on the coffee is meant. The Schümli is an aromatic experience both as coffee, espresso, cappuccino or latte macchiato.